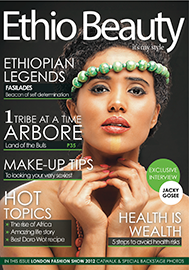 Ethio Beauty magazine is a UK based fashion publication launched in the summer of 2013. Aiming to breaking common misconceptions of Ethiopia and Africa in general the magazine was designed to Engage, Entertain and Educate the world on all aspects of African fashion, culture and lifestyle with intelligent content and informative features. Its Pan-Atlantic appeal has seen a steady growth in the number of subscribers around the world and with a reach of 50,000+ worldwide Ethio Beauty Magazine is fast becoming the ultimate destination for the latest on African fashion and beauty trends around the globe. The near future will see Ethio Beauty Magazine available at the Apple App Store, Google Play and Amazon.